We have a two-party system in this country, but until recent decades, it wasn’t always easy to tell them apart. Southern conservatives tended to be Democrats and Northern liberals were just as likely to be Republicans. In the old days, the parties were more like clubs, each with a full range of ideologies represented in their membership. When Eisenhower’s name came up for president before the 1952 elections, he could have run comfortably in either party. Sure, the Republicans were a wealthier club and tended to think kindly of big business and leather furniture. Democrats were always a little more scruffy. The current trend, however, is to understand the parties as standing for ideologies. But what those ideologies are has been harder to pinpoint. After all, the people calling themselves conservatives are no longer for conserving anything. Conservatives used to believe in the status quo; liberals wanted change. Nowadays, the conservatives are calling for a radical agenda. That is what they used to accuse liberals of wanting. The problem is that we have defined the two points of view wrongly. They are not merely conservative vs. liberal. In fact, the specific ”litmus test” issues raised by them are fairly recent. Those issues — welfare reform, reduced taxes and prayer in school on the so-called ”conservative” side and gender equity, racial equality and food labeling on the liberal side — are not beliefs held in a vacuum, but represent a deeper difference in how the two sides understand the world. Underneath the specific issues there are deeper tendencies: Government redress of social inequity and regulation of powerful entities to protect the consumer and environment on the one side and smaller government and individual responsibility on the other. Those competing world views can best be understood as the view of the lions and that of the lambs. The lions are in charge of their lives. They do what they want when they want to do it. Food is there for the taking and they are king of all they survey. It is hardly surprising they value initiative. Lions start businesses and create jobs; they provide leadership. Ah, but the lambs flock together helplessly, blown about by fortune and foul winds. And they have a worrisome likelihood of becoming someone’s bowl of Cheerios. Initiative doesn’t have much to do with it. 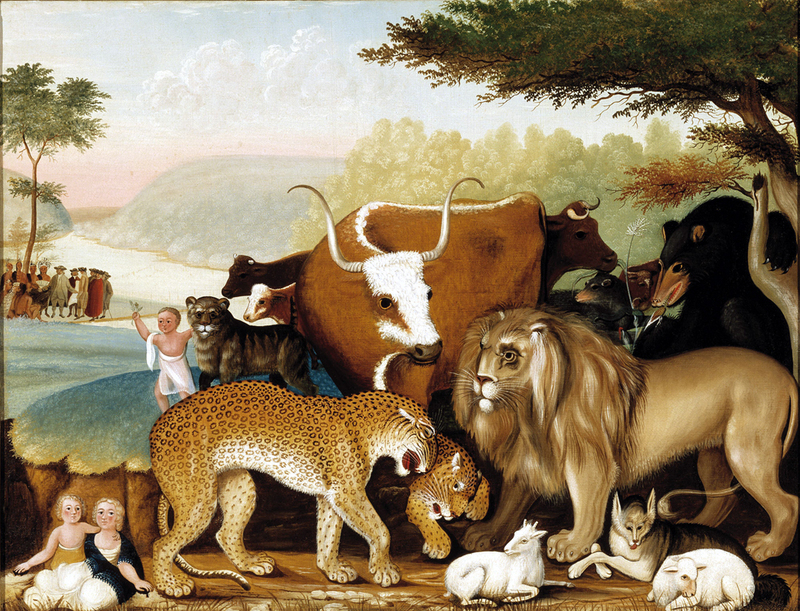 In reality, the world is made up of both lambs and lions, and a sound public policy needs to accept this duality. The problems and arguments arise because Republicans create policy based on their belief that everyone is a lion. Democrats make policy believing that everyone is a lamb. Neither will make lasting, effective policy beginning from such partial visions of human nature. You can see the reality of the metaphor in the culture of victimhood that pervades Democratic constituency. ”I can’t succeed because X won’t let me.” Let X stand for white males, poverty, lack of self-esteem, or any of a host of bogeymen. In each, the victim remains passive, a lamb bleating helplessly. As for the Republicans, their rhetoric is largely a holdover from Victorian Horatio Alger books, where to be poor is to be lazy, and anyone with gumption can become a millionaire and smoke large, smelly cigars. Neither world view alone is sufficient and true. Lions recognize that ”empowerment” doesn’t come from committees, it comes from within. Lambs recognize that if the lion is allowed to have his way, someone will get hurt. So Republicans hate any law that holds personal initiative in check, even when that initiative may pollute our air or enslave our populace. And Democrats hate any law that fails to protect the helpless, even when the helpless may not need protecting. One irony is that although most Republican movers and shakers are in fact lions, many of their constituents are helpless lambs who feel powerful by proxy, growing puff-cheeked in the fantasy of individual freedom and power. Look at any Klan meeting in the South or any militia in Idaho and you will see a flock of losers strutting their stuff. Concomitantly, although Democrats act as if everyone were a lamb, the party leadership is almost wholly made up of lions. At some level, they must recognize this disparity. Nancy Pelosi doesn’t need welfare. A lot of vitriol is thrown in the mistaken belief that Republicans or Democrats are the Great Satan who either oppresses the little guy or constrains our initiative. In fact, the balance of carnivore and herbivore is a sign of ecological health. Without a certain amount of regulation, we would have no air to breathe and no water to drink. With no regulation, what you get is Bhopal, Minimata and Chernobyl. But too much regulation and you get a nation of faceless bureaucrats. It is the nature of politics, as that of animals, to find its balance precariously and fitfully.